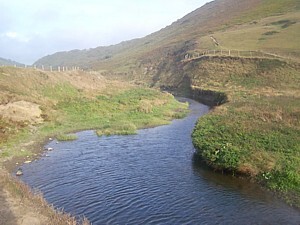 Duckpool is is found at the foot of the Coombe Valley, a long open valley that is cut in two by a meandering stream. 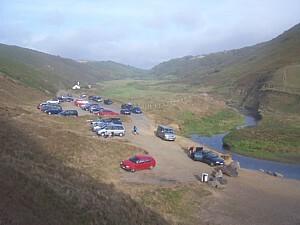 There are beautiful walks to be had here with streams and criss cross bridges wending up to Stowe or bracing walks that lead both north to Sandymouth and south along the coast to Stowe Cliff and beyond.. The coast here is somewhat Jurassic in feel. Vast cliffs give way to ridges of worn rock that merge into the sea and inland a sheltered valley that has a timeless quality both in and out of season. The beach caters for all manor of seaside activities. 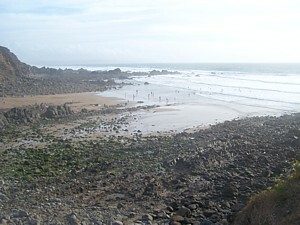 Duckpool is excellent for surfing and sunbathing, combining sandy areas of beach with more craggy outcroppings and pebbly areas that are home to rock pools and all manor of sea life. This area boasts some fine walks along the cliff tops. Inland at the head of the Coombe valley are Lee Wood and Stowe Wood, the latter being the site of an old settlement. Duckpool is a pebbly, shelving beach with a central sandy area that is revealed as the tide recedes. The beach boasts good surf and good marine life too but it is generally not recommended to swim here. Take Heed...There are no lifeguards at Duckpool. There are limited amenities at Duckpool. There is a public toilet and a car park. Coombe and Stibb are a short distance from here, has is Kilkhampton and this neck of the woods offers the holiday maker all types of accommodation, from secluded locations for romantic couples to caravan sites and holiday parks for families.